If you try out Netrunner in a VirtualBox, please make sure to give it >1200 MB RAM. (Tip: To restore the usb stick to normal size, download bootice from here and follow these instructions (windows and linux)). 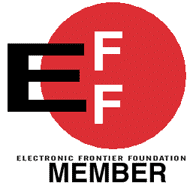 You now have a LIVE USB stick with Netrunner on it, ready to boot! 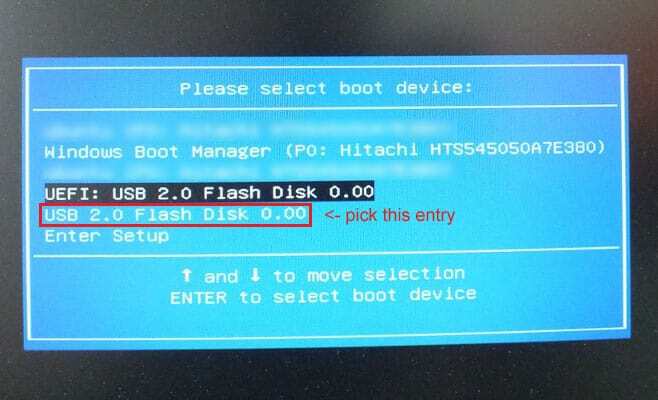 Before you install, you need to make sure Secure Boot is disabled (normally it can be disabled during boot process, please google for “your hardware device + disable secure boot”). » This will be performed on the machine on which you wish to install Netrunner. You do not have to permanently install Netrunner at this point. 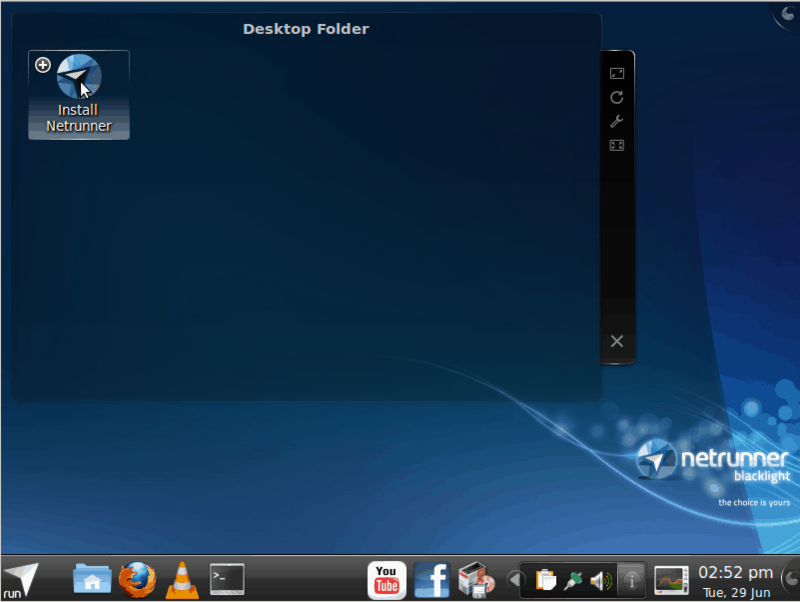 You can explore the operating system from your USB-Stick to see how you like it without affecting your existing setup. Note: Make sure your machine is set to boot from USB first. You may need to check your BIOS to enable this functionality. 2. Boot the machine and watch stuff happen! Note: In the LiveUSB environment you can explore Netrunner without making any changes to your existing system. In the LiveUSB environment the performance will usually be less compared to the normal, installed mode. 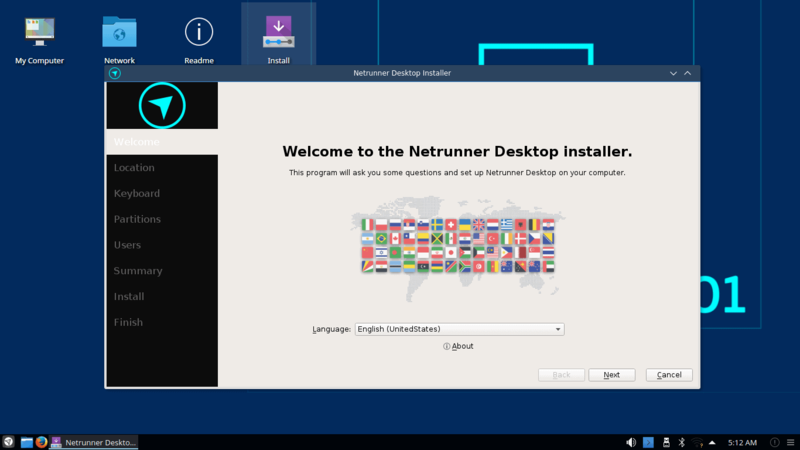 Once you are ready, double-click on the “Install Netrunner” icon. 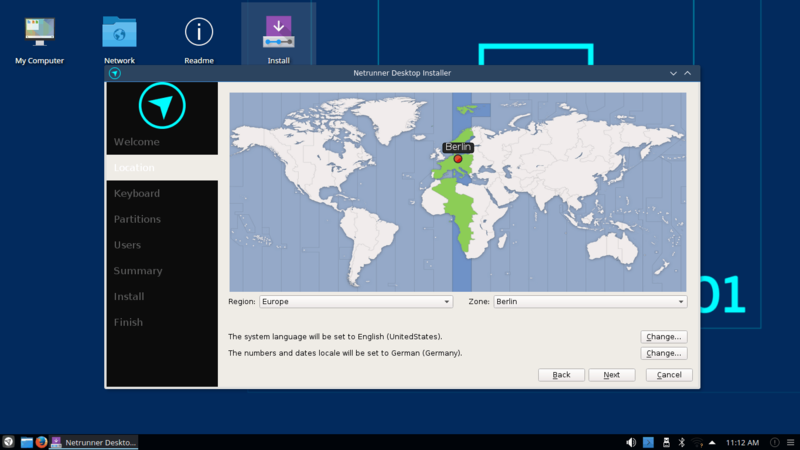 4.1 First choose your preferred language. 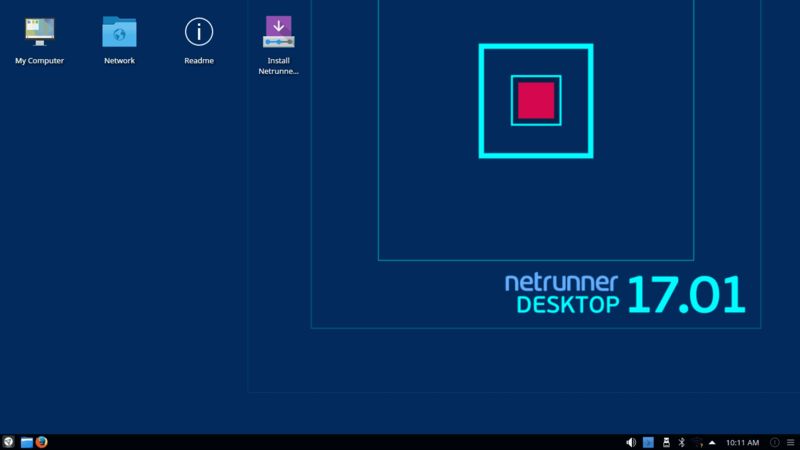 Option 0: Alongside: Install Netrunner “side-by-side” an existing OS, giving it a portion of the hard drive (Note: this option is sometimes not available). 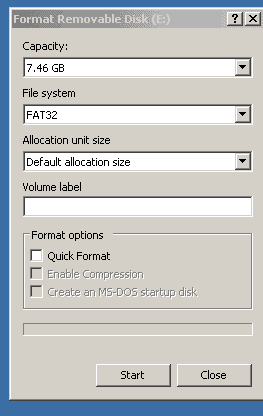 Option 1: Replace: Simply pick an exisiting partition and install Netrunner on that, overwriting everything that currently exists on that partition. Option 2: Erase: Install Netrunner only, giving it the entire hard drive and erasing all other data. 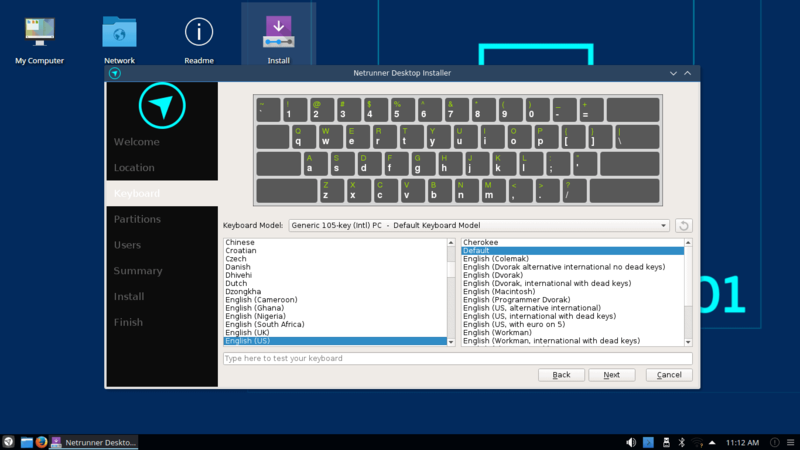 Option 3: Manual: Of course, the installer has also an advanced option where you can set the partitions to your exact liking if you are in need of that level of control. 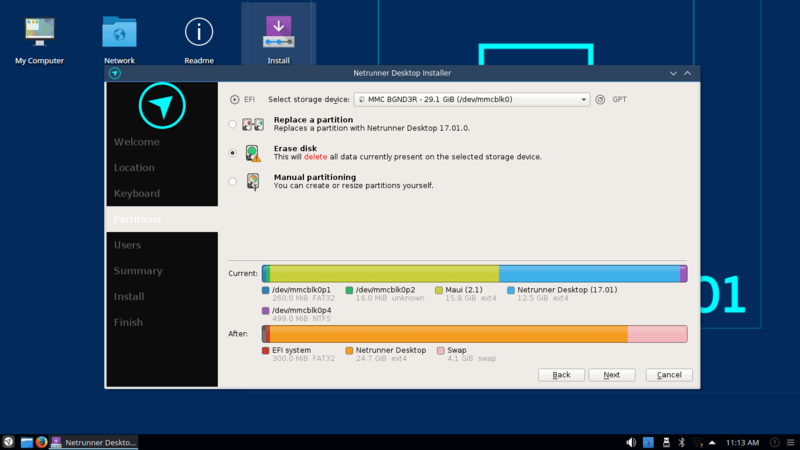 In this screenshot, I’m choosing Erase and installing Netrunner on the whole disk, erasing everything else that is currently on there. 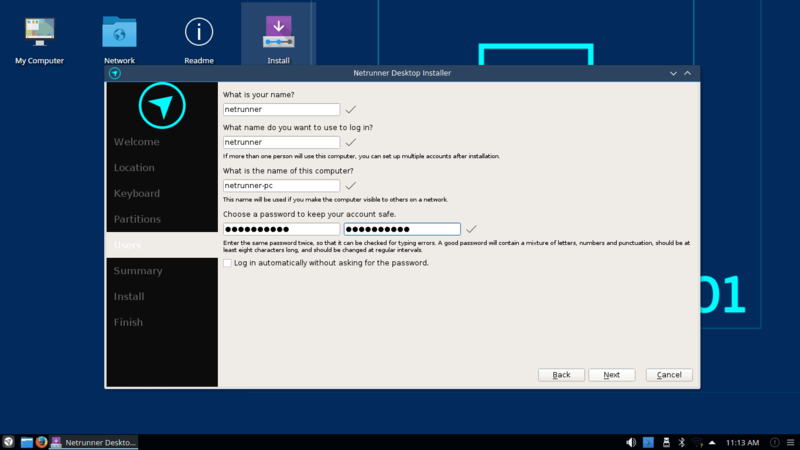 Here you enter your name, username, password and choose the name for your computer and a default login option. Up to this point, you can still cancel the Install process and nothing has been done. If you are ready to install the system, click “Next” and Installation begins. The installer then will proceed with a slideshow and display a progress bar and status information while installing. Note: At times it may seem the installer froze because there seems to be no progress – that’s not unusual, so don’t worry and just give it some time to finish. At a maximum, the installation process should take about 30 minutes, much more likely are 10-15 minutes though (depending mainly on the cpu and hard drive of the machine). If you restart, the system will power down and reboot, so don’t forget to remove the stick after the system has shut down. To give feedback for this article please comment below or further discuss the installation in our forums. Tip: Look out for the README tutorials with tips what you may do at your first boot into Netrunner.